Features galore, but still user-friendly. Formed as a merger of three different telemetrics platforms — Verizon Networkfleet, Fleetmatics and Telogis — Verizon Connect has a wider range of expertise than most fleet management system vendors. Verizon Connect is a one-stop-shop for any size of fleet looking for an advanced FMS, with Vehicle Tracking and ELD compliance. Prices are slightly above the average FMS vendor, but fair for the advanced features provided. Service coverage is international, with offices in ten North American cities and presence in EMEA, Asia Pacific, and Latin America. This review focuses on Verizon’s vehicle tracking platform however Verizon also offer high value asset tracking and field service management – scroll down for more info. Verizon’s FMS suits a range of businesses: specialty trades companies; oil, gas and construction; distribution; utilities; and transportation and logistics fleets. 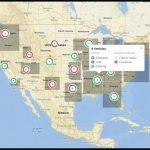 Locality won’t be a concern: As one of the largest FMS providers in the United States, Verizon Connect has 24 offices around with globe. Ten offices are located in North America, in the cities of Aliso Viejo, Atlanta, Austin, Boston, Charlotte, Chicago, San Diego, Scottsdale, Tampa, and Toronto. Neither will fleet size: Fleetmatics primarily served smaller to mid-size fleets and Telogis operated in the large enterprise sector. Both are now a part of Verizon Connect. Verizon Connect’s dedication to simplicity starts with their product but extends to the entire on-boarding experience, thanks to a staff of responsive and communicative agents. Training option include manuals, webinars, and a free in-person demo. The past few years have seen major innovations in hardware quality and connectivity speeds, and Verizon Connect’s Fleet Management System has taken full advantage. 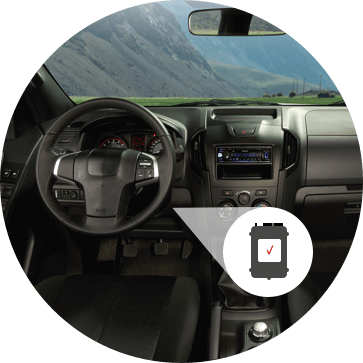 The system includes free installation for tracking units that are hardwired into your engines, and a mobile app that each driver can use to read the latest data. Fleet managers can use an online desktop/mobile dashboard to both gather data and send messages from a central location. Through their dashboard, fleet managers can track unneeded engine idling times and note poor driving habits. Fuel card fraud is more easily detectable, and features such as route optimization and traffic awareness also save fuel. Up-to-the-minute software can quickly deliver work orders, adjust to changes in delivery schedules, and respond to customer complaints. The benefit goes straight to the bottom line: one client counted Verizon Connect as integral to their top-line revenue growth of 20-25 percent. 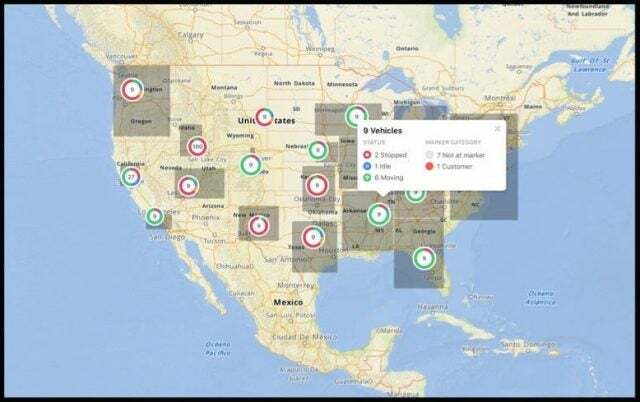 Verizon Connect’s fleet management system also allow managers to track engine diagnostics, view reports on mileage stats and note instances of harsh driving. These features identify maintenance needs early, letting operators can avoid hidden costs. 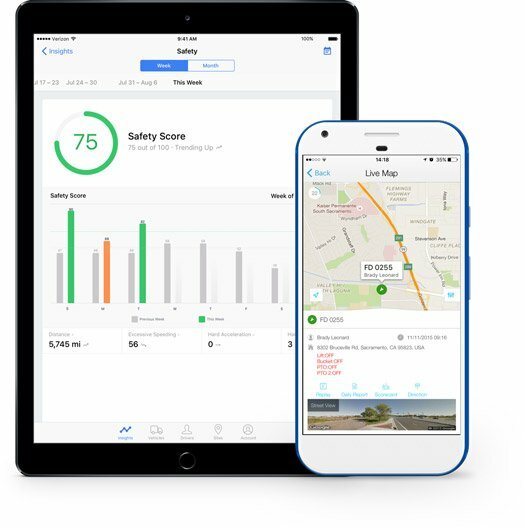 Other features boost safety by recording unsafe driving habits and tracking driving hours, offering up safety statistics through at-a-glance daily graphs. The system can also offer emergency highway and weather alerts. 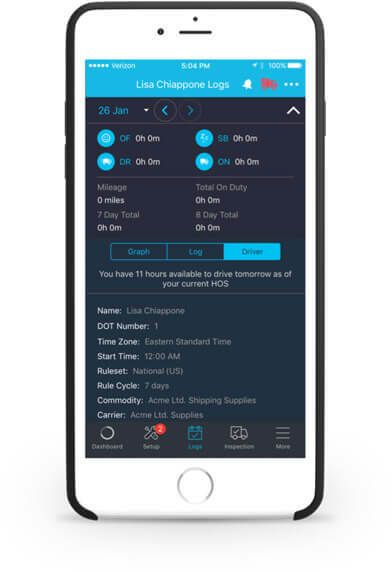 ELD compliance — Verizon Connect’s logbook software is FMCSA-registered. Driver-Vehicle Inspection Report (DVIR) compliance — Drivers can fill out their daily report quickly and easily. International Fuel Tax Agreement (IFTA) compliance — GPS trackers can simplify the process of tracking your fleet’s IFTA miles. Whether you need to track cars, cranes or heavy-haulers, Verizon Connect’s fleet management system includes all the devices you’ll need for free, and they are hardwired into each engine. Get a glimpse of Verizon Connect in action, on desktop, tablet and mobile, in this promotional video from Verizon Connect. While the video doesn’t tell you much about the platform itself, it does demonstrate the wide range of vehicles and customers suitable for Verizon’s services. Visiting Verizon Connect’s YouTube Channel will enable you to watch customer testimonials from the acquired Telogis fleet tracking company. Fleet managers with fixed or movable high-value assets will want to know where they are at all times, even when they aren’t part of a fleet. 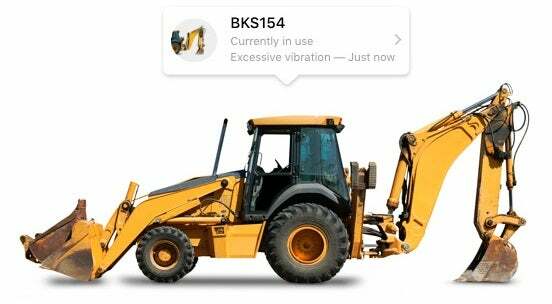 From excavators to shipping containers to sheds, Verizon Connect’s asset tracking solutions can give managers peace of mind that their assets are secure. In addition to simply locating these assets in real-time on desktop or mobile, Verizon Connect can improve a company’s response times and efficiency, while deterring asset theft. Interested in tracking high value assets as well as your fleet of vehicles? Get asset tracking price quotes here. Verizon Connect also offers a field service system called WORK, for operations that have mobile workers but aren’t shipping long distances. The field service software prioritizes the business needs of specialty trades including cable companies, contractors, or landscaping operations. Data — You’ll see fixed costs, variable costs, available resources, and job requirements. Scheduling and dispatch — Quickly send new assignments to your drivers, anywhere, anytime. An online dashboard — Visualize your operation in real time. Route optimization — Easily determine which route between work orders is the most efficient overall. Electronic forms and receipts — Going paperless is not only better for the environment, but faster for you. Interested in Field Service Management as well as Fleet Management software? Get field service software price quotes. Verizon Connect’s onboarding process is one of the easiest to expect from an FMS company. They offer fleet managers their hardware units for free, and will also send agents to install the devices at no extra charge. Their customer support team operates at scale: Verizon Connect fielded over 122,000 customer distress calls just in 2017. Verizon appears to value this aspect of their business, as they expanded their customer success organization by over 65 percent in 2017. You can visit Verizon Connect’s support page to find the most appropriate support phone line to call for your specific software issue. The cost of an FMS tends to vary depending on the size of your fleet and the length of your contract. Expect the core Verizon Connect fleet management system to fall within the typical range for an advanced FMS, though you can get a more accurate quote within minutes through a phone call or by using our comparison form. The decision to buy or lease your fleet’s hardware units is moot with Verizon Connect, which gives them free. It also offers a free demo, which you can sign up for on their website, and will cover installation costs itself. Expect one additional charge, however: Verizon Connect does not provide the tablets or smartphones that drivers will need on hand in order to present their HOS data during a roadside inspection. Operators will need to cover the costs for these handheld devices themselves. Fleet operators in need of a comprehensive FMS that gathers all tasks and data on the same platform will be well served with Verizon Connect, which is strong in safety, compliance, and efficiency. Operators in need of a more basic system may not find this FMS to be cost-effective, but all others should satisfied. The company’s emphasis on customer service is an additional value-add. Compare all the best fleet management systems — not just Verizon Connect — in minutes through Tech.Co’s quick and easy comparison form. vehicle tracking & fleet management software.